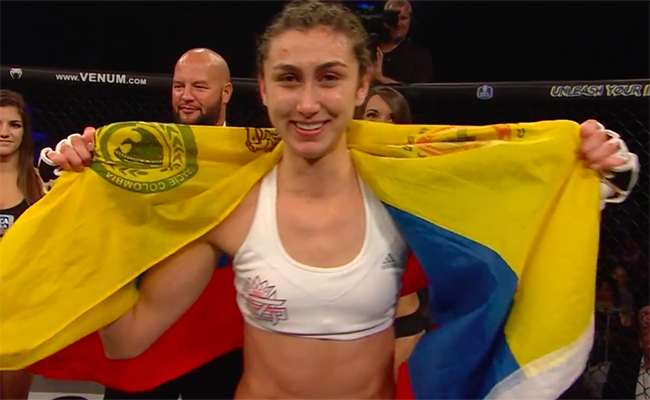 Sabina Mazo is a Colombian fighter with a 6-0 record making her UFC debut vs. Maryna Moroz on April 30th, 2019. She has already fought the full 25 minutes twice in her career and her opponents have a combined record of 29-10. That is an unusually strong strength of competition for the still developing regional women’s MMA scene. She first made headlines with back to back headkick knockouts:https://youtu.be/Vor6987oBO0 and has since become LFA Champion. I had the chance to talk a bit with “The Colombian Queen” before her UFC debut. What is your training background? I started with boxing and Brazilian Jiu-Jitsu and Muay Thai after. Can you talk about the headkick KOs? I noticed they aren’t just naked kicks. You’re setting it up with your hands or during the transition between clinch and punch range. Is it something you’ve already drilled countless times? I analyze and read the combat and try to combine kicks with punches… but it isn’t the only technique that I practice. I practice a lot of different variations. You started off your career against two undefeated fighters, 3-0 Alejandra Lara and 8-0 Reina Cordoba. Was it difficult finding people to fight early on? It was hard to find fights in Colombia so we started with what we had! After those two fights, you took a 1.5 year break before fighting again, debuting with LFA. Was there any reason for the lay off? Did you move full time in 2017? I wanted to train and become better so I took my time before fighting again and yes I moved completely in 2017. Where are you doing your fight camps for this fight and before? I always train at Kings MMA with Master Rafael Cordeiro and everyone here. You’re making your UFC debut against a 6 fight UFC veteran in Maryna Moroz, yet you’re coming in as the betting favorite. Do you feel any added pressure? I don’t feel pressure because I train as hard as possible for all my fights, no matter where and against who I will always give my best. How do you think you match up with Valentina Shevchenko, Jessica Eye (the next challenger) or Joanna Jedrezjczyk? Great fights and I will climb all the way up to fight against anyone there. Did you grow up in Colombia? I saw some interviews you did and was wondering if you grew up learning English or being exposed to it quite frequently? I grew up in Colombia and learned English when I lived 3 years in Miami, but all the practice made my English better. How’s the weight cut to 125? You seem mature beyond your 21 years and you’re already in the UFC. Can you give us a little background on your life, growing up/upbringing etc? I consider my self mature, I had experiences and my family has always shown me the world in a “raw” way so I think that helped me be who I am. Any predictions for you fight with Maryna Moroz? What’s your attitude towards MMA, martial arts? From your social media and fights, I get this feeling that martial arts is not just a means to an end, a way to make money… that you really respect the “spirit” and “way” of martial arts. I believe martial arts will always live. Of course, money can change some visions but, in my case, I will always be going towards to becoming a better martial artist. How come in your debut fight they had your name as Sabina Mendoza? And on Tapology it is Sabina Mazo Isaza? It’s Sabina Mazo Isaza… in that fight they made a mistake in my last name.